If you don’t use Office or a dedicated mail app on your Windows 10 machine, the built-in mail app is pretty good. It does everything you would expect and is baked into Windows, so there is no issue with compatibility. However, there are a couple of settings you might need to tweak to get it running right. One of them is the sync frequency. Here is how to change sync frequency of the Windows 10 Mail app. I use the Mail app a lot for testing purposes. It’s small, easy to use and looks pretty good too. But for some reason, when it installs, it sets the update frequency to ‘Based on usage’. That means if you don’t use it all the time, it won’t check for mail all the time. That’s fine for occasional users but not so much for those of us who like testing things or playing around. 1. Navigate to the mail app and click the gear icon in the lower left. 2. 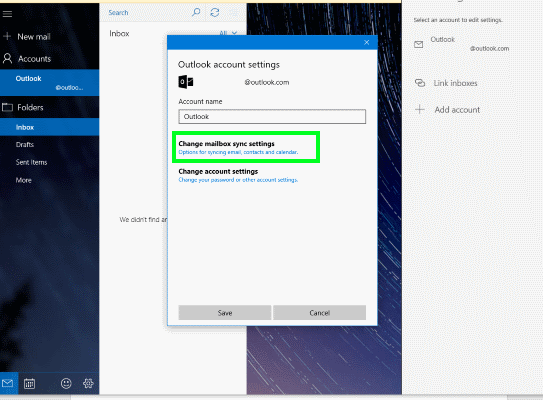 Select Manage Accounts and then Change mailbox sync settings. 3. Select a time period from the list or ‘as items arrive’ which is more useful. Now your Mail app should automatically sync either at a fixed time as selected or trigger an update as mail arrives at Outlook. While the based on usage setting is supposed to improve over time, it isn’t the best setting for email. Some mails are time sensitive and I see no reason why you would keep them hanging until Mail decides to go get them!